Back when I was working on Project Squirrel Gun, I was playing with the small game hunting concept, which unfortunately is the likely best case scenario if things go dark big time. 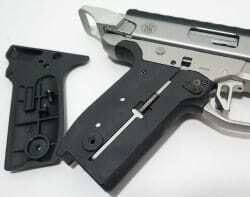 So why not a Project Squirrel Pistol? Rather than trying to find an inexpensive bolt action pistol to match the rifle, I decided to look for a semi-auto solution since a quality long-range shooting .22 revolver is as elusive as it is expensive. So once in the .22 long rifle auto pistol market, I only had about two dozen guns to choose from. But when looking for a real long distance tack driver over a concealed carry format along with some desired characteristics included a target weight barrel, a threaded muzzle, optics mountable, and a friendly aftermarket community, the selection rapidly narrowed to Ruger, Browning, and Smith and Wesson. Of the three brands, the S&W was the least expensive with street prices beginning at $350 and it had a fast-growing pile of aftermarket upgrades of both pistol parts, barrels, mag enhancements, and grips. Although the Victory was only a couple years old, and I’d never even shot one, the collection of companies supporting the Victory was enough to convince me that this thing was really a Thing. The Ruger is an excellent choice and one I chose for my B.O.L.T pistol. And with the new easy-takedown Ruger Mark IV, it’s hard to ignore that as the go-to option. The problem is that the Ruger is still expensive, still without a threaded barrel, still without a healthy appetite for anything stuffed in it’s mouth, and finally, while running well when dirty, the Mark series of Ruger .22s are not known for being the most friendly when digging deeper than cracking open the case. The Browning Buckmark is a fine firearm, but lacks heavily in the aftermarket arena. If the pistol were perfect, than that would not be an issue, but like about everything except the Colt Python, is there definitely room for improvement. Bolt-on options are available for the Buckmark, but tweaking the innards is still left for the professional gunsmith. One standout that is relatively new to the Ruger/Luger looking autopistol is the SW22 Victory from Smith and Wesson. Currently there are three versions. All have in common a heavy steel receiver and five-and-a-half inch target bull barrel, plastic grips on a mostly plastic grip frame. 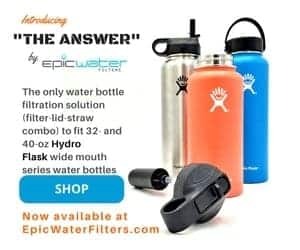 The only real differences between the three models is one has a Kryptek and blacked-out color scheme, and the other two are mostly satin stainless steel, one with a threaded muzzle, one without. So if you were blindfolded, all three would feel and operate the same. With all the excitement about the new Ruger Mark IV with it’s one-button takedown, the one-screw takedown of the SW22 Victory seems mundane. An excessive amount of work in fact. But either way, the SW22 Victory almost falls apart once the single receiver bolt is removed using a ⅛ inch hex wrench. Unscrew one more hex bolt next door and you can remove the barrel from the receiver. So simple and quick that the SW22 Victory is just asking to be tinkered with. The S&W Victory is plenty good straight out of the box. But like a base model AR15, the Victory is begging for customization. Smith and Wesson loaded up the Victory with an excellent trigger action, a target barrel, and fabulous fiber optic hard sights. But the grips, the mag release button, the magazine disconnect safety feature, and a few other things are ripe for upgrade. Some more seriously than others. And even the barrel has not escaped the option to upgrade. 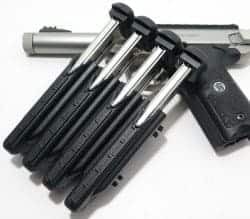 In fact, the ease of swapping the barrel and even some other components makes one wonder if this is what the boys at S&W had in mind from the beginning since the gun is rock solid from a foundational standpoint. So let’s get to work. Starting on the magazine side, there are two mag upgrades worth noting. The first is a new baseplate. Why, you might ask. Because the tiny base plate on the factory magazines is small, smooth, and not the most talkative when it comes to answering the question if it is fully seated or not. The TandemKross VictoryPro extended baseplate. adds a little more bulk and a gripping surface, the VictoryPro makes seating and unseating mags ever more positive. The factory mag only holds the standard state compliant 10 rounds, but an 11th round option is available with a shorter follower. TandemKross makes one of those too and it’s called the Maximus Plus1. By shortening up the follower an eleventh round fits in the magazine body just fine. Plus they made the follower bright red instead of basic black so it is vastly more obvious where the bullets stop and the follower begins. Supporting magazines during activity involves roll pouches of some sort. TandemKross makes a modular mag pouch option called the Quick Grip pouch. Made of durable Zytel, and with adjustable retention the Quick Grips work with all major .22 mag options from Ruger to Browning to Smith and Wesson, and even Colt. So since a Squirrel Pistol is going to live in the field, magazine management is of consideration. These upgrades are so easy, a nine-year old girl could do them. And that’s because a nine-year old girl shows you how in the TandemKross installation videos. And that same fourth grade girl probably has a faster tactical reload than you do. In fact the video of the install of TandemKross’s Titan Extended Magazine Release for the SW22 is a pleasure to watch and far more entertaining than most other dry monotone gunsmithing videos. Speaking of the Extended mag release, it is another go-to part. The factory release is both too big and too small. It’s too big for not having a secondary use as a rest, and too small to easily be reached by a smaller hand, say that of a nine-year old girl. Another pistol-side upgrade regarding magazines is the magazine disconnect safety feature. This is a metal strip that runs underneath the left side grip panel. It detects the presence of a mag and prevents the gun from being fired without a magazine fully seated. The problem in a survival situation is that you may want to shoot the gun without a magazine in place. For instance if you lost your mags somehow and you loaded a directly into the breech. Or the magazine inadvertently was ejected in the heat of the battle or the hunt. You could push up on the magazine disconnect lever with your fingernail and the gun will fire just fine, but that’s pretty awkward. Or you could remove the disconnect lever all together, but then you also loose the spring that launches the mag out of the Victory with more satisfaction than most pistols offer. So a better solution is the TandemKross Magazine Disconnect replacement. This thin metal strip replaces the factor disconnect keeping the spring action intact, but eliminates the need for a mag to be present in order to fire the weapon. Pulling the slide back on the Victory can be a challenge. First of all, it takes a surprising amount of effort to begin the cycle. Second, if you don’t slingshot the bolt, you may get a bit of a bite from where the slide mates with the frame. Only a small triangular portion of the back of the receiver moves. More than a Ruger, but less than a Browning. And that little amount is enough to pinch your fingers if you let the slide down rather than just letting go of it. TandemKross addressed this with their Halo Charging Handle. The Halo is a thumb-sized loop that clamps to the existing jimping on the slide’s walls. Not only does the Halo make it easy to cycle the bolt, but it gives you additional options for grabbing and charging the pistol under conditions where it might be impossible otherwise such as, one handed, cold hands, wet or slick fingers, and weak muscles. Surprisingly, a full cycle of the Victory’s bolt actually takes quite a bit of effort. Yes, it is just a .22 but something about the leverage cocking hammer back requires a surprising amount of effort. A few times I’ve even thought something was jammed, but no, just in need of a healthy tug. 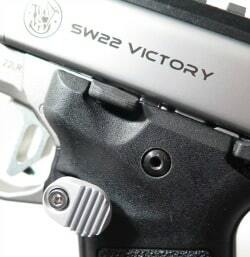 The SW22 Victory is known for having an excellent out-of-the-box trigger. 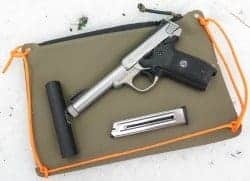 Unlike most other sub-custom .22 auto pistols, the Victory has smooth take up, a clean break, and acceptable overtravel and reset. However the trigger shoe is old school and a little sloppy side to side. The Victory Trigger from TandemKross is an excellent upgrade providing a heavily textured flat face and micro adjustments allowing a drop in pull poundage, reduced and adjustable takeup and overtravel, and a second color option. While installing the Victory trigger requires a bit more surgery than the other upgraded parts, it is also a great time to learn how your gun works. And don’t worry, TandemKross also sells an extra trigger-side spring and detent kit for three bucks for when your factory one goes flying across the room. TandemKross does suggest, however, doing some of the gun work inside a plastic bag or box, and always wear safety glasses. I concur. In part 2 of this themed build, we will take the Victory outside with a choice of optics, carry options, and things to screw onto the muzzle.